Next Stop: Food | Food Blogger located in Sydney Australia: Noodle Market and Intercontinental Lets Do Dessert! Noodle Market and Intercontinental Lets Do Dessert! Both events are held in the Month of October Annually. Noodle Market Times: October 10th - 26th, Monday to Friday 5pm to late and Weekends 4pm to late. The Annual Good Food Month of October, one of my favourite months of food, food and more food. We went straight after work and the lines were reasonable at that time. But as it got darker you could see more people in the queues and more lights and sounds. Now first stop the shop my friends can’t stop talking about: Wonderbao! We had to wait about 5 mins before we were served. Three Gua Boa for $20 or $7 each, we opted for the 3 boa deal. We only got the Twice Cooked Pork Belly with pickled carrots, Daikon, cucumber and hoisin sauce. First mouthful was like tasting heaven, so soft and tender. Absolutely delicious! While walking through the park I noticed some fried fingers and thought they were Sweet potato fries. Candice was quick to correct me and told me they were Fried Squid. We got a serving from the Eight Modern Chinese Stall and these were very fresh and crispy. Last thing we tried was the skewers from Hoy Pinoy. These things were so hot, everywhere I looked someone had a big skewer in their hand! 2 Skewers for $10, there was BBQ chicken or BBQ Pork Belly. These looked amazing and watching them cook on the BBQ was making me drool! I really did want to try the Harajuku Gyoza, but by the time we had eaten our full, the line was way to long to wait in. Next time! We also got to see the lovely Chinese Dragons and at night they light up the entire place! Drumming and awesome acrobats, it was a great show! 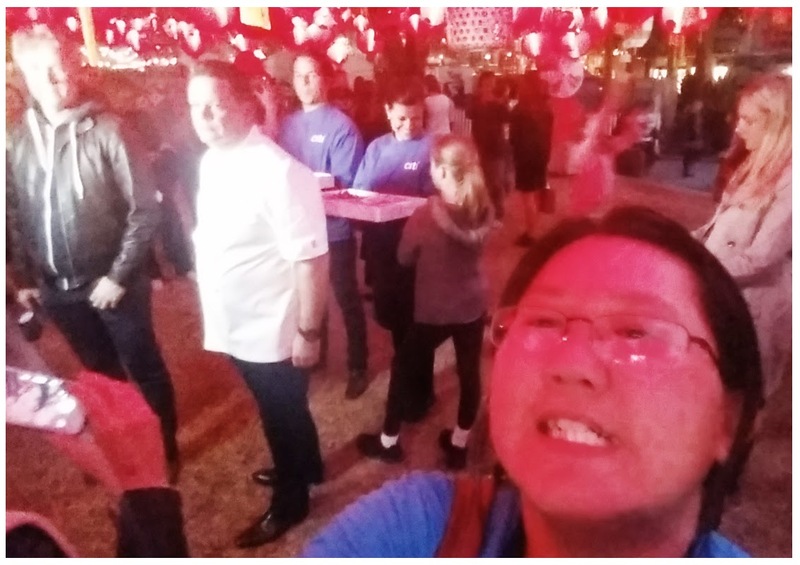 Also a little bit of entertainment for me, Channel Ten were doing a live broadcast with Masterchef judge Gary Mehigan. Look at my cheeky selfy! Also part of Good Food and wine month is “Lets do dessert!”, I am use to this being called Sugar hit from previous years. I love these $20 desserts usually accompanied with a dessert wine. I went to the Intercontinental this year with the girls and it was also Felicia’s birthday dinner. I admit this was a little hard to eat with a fork and spoon, but must eat it classy! By lightly tapping the layers to get a spoonful, the first taste was absolutely interesting. The pineapple was a hidden surprise on the eclair, it was very strong and kind of overwhelmed the other flavours. The chantilly cream on the eclair was very nice on its own. And the accompanying dessert wine was just great for an end to an evening. Both of these events end at the end of the month, you must go try before this ends. This is my favourite month for food and so much to offer! Noodle Market has plenty of other food stalls and if I lived in the city I would go every night! I have been told the Messina stand is very popular too! Lets do dessert usually starts after 9pm, some start earlier. Head to the website http://sydney.goodfoodmonth.com/letsdodessert to see the entire listing of restaurants participating in this event and the good thing is all of them cost $20 each. choc Chip! it was very fun if you decide to go (Still time!!) or go next year, I suggest going early. Once that sun sets ppl flock to the park! oh no still queues! They are so delicious! I liked the pork! love that eclair! it is soooo good, goes so well with the passionfruit! i loved the wonderbao and hoy pinoy offerings, i was too busy eating to take photos! I know what you mean Amy they were yummy! I believe that the only words sweeter than "eclair" could be "double eclair". Especially eaten under upside down rainbow umbrellas. Magic!! I unfortunately did not get to attend a wedding here, but instead attended a conference and can I just say - the party planning team was totally mind blowing.